This article is about the manufacturer. For the song, see Mercedes Benz (song). Mercedes-Benz (German: [mɛʁˈtseːdəsˌbɛnts] or [-dɛs-]) is a German global automobile marque and a division of Daimler AG. The brand is known for luxury vehicles, buses, coaches, and trucks. The headquarters is in Stuttgart, Baden-Württemberg. The name first appeared in 1926 under Daimler-Benz. In 2018, Mercedes-Benz was the biggest selling premium vehicle brand in the world, having sold 2.31 million passenger cars. Mercedes-Benz traces its origins to Daimler-Motoren-Gesellschaft's 1901 Mercedes and Karl Benz's 1886 Benz Patent-Motorwagen, which is widely regarded as the first gasoline-powered automobile. The slogan for the brand is "the best or nothing". Karl Benz. Benz made the 1886 Benz Patent Motorwagen, which is widely regarded as the first automobile. Gottlieb Daimler, founder of Daimler-Motoren-Gesellschaft. Mercedes-Benz traces its origins to Karl Benz's creation of the first petrol-powered car, the Benz Patent Motorwagen, financed by Bertha Benz and patented in January 1886, and Gottlieb Daimler and engineer Wilhelm Maybach's conversion of a stagecoach by the addition of a petrol engine later that year. The Mercedes automobile was first marketed in 1901 by Daimler-Motoren-Gesellschaft (Daimler Motors Corporation). Emil Jellinek, an Austrian automobile entrepreneur who worked with DMG, created the trademark in 1902, naming the 1901 Mercedes 35 hp after his daughter Mercedes Jellinek. Jellinek was a businessman and marketing strategist who promoted "horseless" Daimler automobiles among the highest circles of society in his adopted home, which, at that time, was a meeting place for the "Haute Volée" of France and Europe, especially in winter. His customers included the Rothschild family and other well-known personalities. But Jellinek's plans went further: as early as 1901, he was selling Mercedes cars in the New World as well, including US billionaires Rockefeller, Astor, Morgan and Taylor. At a race in Nice in 1899, Jellinek drove under the pseudonym "Monsieur Mercédès", a way of concealing the competitor's real name as was normal and very regularly done in those days. The race ranks as the hour of birth of the Mercedes-Benz brand. In 1901, the name "Mercedes" was registered by Daimler-Motoren-Gesellschaft (DMG) worldwide as a protected trademark. The first Mercedes-Benz brand name vehicles were produced in 1926, following the merger of Karl Benz's and Gottlieb Daimler's companies into the Daimler-Benz company on 28 June of the same year. Throughout the 1930s, Mercedes-Benz produced the 770 model, a car that was popular during Germany's Nazi period. Adolf Hitler was known to have driven these cars during his time in power, with bulletproof windshields. Most of the surviving models have been sold at auctions to private buyers. One of them is currently on display at the War Museum in Ottawa, Ontario. The pontiff's Popemobile has often been sourced from Mercedes-Benz. In 1944, 46,000 forced laborers were used in Daimler-Benz's factories to bolster Nazi war efforts. The company later paid $12 million in reparations to the laborers' families. Mercedes-Benz has introduced many technological and safety innovations that later became common in other vehicles. Mercedes-Benz is one of the best-known and established automotive brands in the world. Daimler cooperates with BYD Auto to make and sell a battery-electric car called Denza in China. In 2016, Daimler announced plans to sell Mercedes-Benz branded all-electric battery cars in China. Argentina South America Manufactures buses, trucks, the Vito and the Sprinter van. This is the first Mercedes-Benz factory outside of Germany. Built in 1951. Australia Australia Various models were assembled at the Australian Motor Industries facility in Port Melbourne from 1959 to 1965. Canada North America Fuel cell plant in Burnaby, British Columbia opened 2012. Finland Europe Valmet Automotive, New A-series (W176) is manufactured in Uusikaupunki since late 2013, being the first M-B passenger car ever built in that country. India Asia Bangalore (MBRDI), Pune (Passenger cars). Chennai (Daimler India Commercial Vehicles Pvt. Ltd.) Buses, Trucks & Engine Manufacturing unit. Russia Eurasia Joint venture Mercedes-Benz Car Trucks Vostok in Naberezhnye Chelny (jointly Kamaz). Available in trucks Actros, Axor, multi-purpose auto four wheel drive medium trucks Unimog. Mercedes-Benz Sprinter Classic is also produced in Russia. South Africa Africa The assembly plant is located in East London, in the Eastern Cape province, where both right and left hand versions of the C-class are built. South Korea Asia Mercedes-Benz Musso and MB100; Ssangyong Rexton models manufactured by SsangYong Motor Company. United States North America The Mercedes-Benz GLE-Class Sport Utility, the full-sized GL-Class Luxury Sport Utility and the Mercedes-Benz C-Class vehicles are all built at the Mercedes-Benz U.S. International production facility near Tuscaloosa, Alabama. Trucks (6,000 per year in the early eighties) were once assembled in Hampton, VA. Since its inception, Mercedes-Benz has maintained a reputation for its quality and durability. Objective measures looking at passenger vehicles, such as J. D. Power surveys, demonstrated a downturn in reputation in these criteria in the late 1990s and early 2000s. By mid-2005, Mercedes temporarily returned to the industry average for initial quality, a measure of problems after the first 90 days of ownership, according to J. D. Power. In J. D. Power's Initial Quality Study for the first quarter of 2007, Mercedes showed dramatic improvement by climbing from 25th to 5th place and earning several awards for its models. For 2008, Mercedes-Benz's initial quality rating improved by yet another mark, to fourth place. On top of this accolade, it also received the Platinum Plant Quality Award for its Mercedes’ Sindelfingen, Germany assembly plant. J. D. Power's 2011 US Initial Quality and Vehicle Dependability Studies both ranked Mercedes-Benz vehicles above average in build quality and reliability. In the 2011 UK J. D. Power Survey, Mercedes cars were rated above average. A 2014 iSeeCars.com study for Reuters found Mercedes to have the lowest vehicle recall rate. Mercedes-Benz offers a full range of passenger, light commercial and heavy commercial equipment. Vehicles are manufactured in multiple countries worldwide. The Smart marque of city cars are also produced by Daimler AG. The Mercedes-Benz 600 or 600S Pullman Guard limousines offer the option of armour-plating and have been used by diplomats worldwide. "E" (for "Einspritzung") indicates the vehicle's engine is equipped with a petrol fuel injection. Also used for electric models and plug-in hybrids. "BlueTEC" indicates a diesel engine with selective catalytic reduction exhaust aftertreatment. "CGI" (Charged Gasoline Injection) indicates direct gasoline injection. Rationalisation of the model nomenclature was announced in November 2014 for future models. The changes consolidate many confusing nomenclature and their placements in the model range such as CL-Class is now called the S-Class Coupé. The naming structure is divided into four categories: core, off-road vehicle/SUV, 4-door coupé, and roadster. AMG GT, and V-Class are unaffected by the change. In October 2016, Mercedes unveiled the X-Class; a pickup truck built on the Nissan Navara. At the 2016 Paris Motor Show, the company announced the EQ, a family of upcoming battery electric vehicles based on a modular platform, expected to represent up to 25% of its global sales by 2025. 2 emissions of 74 grams/km in the New European Driving Cycle. Since 2002, Mercedes-Benz has developed the F-Cell fuel cell vehicle. The current version, based on the B-Class, has a 250-mile range and is available for lease, with volume production scheduled to begin in 2014. Mercedes has also announced the SLS AMG E-Cell, a fully electric version of the SLS sports car, with deliveries expected in 2013. The Mercedes-Benz S400 BlueHYBRID was launched in 2009, and is the first production automotive hybrid in the world to use a lithium-ion battery. In mid-2010, production commenced on the Vito E-Cell all-electric van. Mercedes expects 100 vehicles to be produced by the end of 2010 and a further 2000 by the end of 2011. In 2008, Mercedes-Benz announced that it would have a demonstration fleet of small electric cars in two to three years. Mercedes-Benz and Smart are preparing for the widespread uptake of electric vehicles (EVs) in the UK by beginning the installation of recharging points across their dealer networks. So far 20 Elektrobay recharging units, produced in the UK by Brighton-based Elektromotive, have been installed at seven locations as part of a pilot project, and further expansion of the initiative is planned later in 2010. In May 2017, Mercedes partnered with Vivint Solar to develop a solar-energy home storage battery. In February 2018, it was announced that Mercedes cabin air filters earned the Asthma and Allergy Friendly Certification. Mercedes is to open its sixth battery factory in 2018, which makes it a tough competitor to Tesla, Inc. The six factories will be established across 3 continents. The two companies which were merged to form the Mercedes-Benz brand in 1926 had both already enjoyed success in the new sport of motor racing throughout their separate histories. A single Benz competed in the world's first motor race, the 1894 Paris–Rouen, where Émile Roger finished 14th in 10 hours 1 minute. Throughout its long history, the company has been involved in a range of motorsport activities, including sports car racing and rallying. On several occasions Mercedes-Benz has withdrawn completely from motorsport for a significant period, notably in the late 1930s, and after the 1955 Le Mans disaster, where a Mercedes-Benz 300 SLR rammed another car (An Austin-Healey), took off into the stands, and killed more than 80 spectators. Stirling Moss and co-driver Denis Jenkinson made history by winning the 1955 Mille Miglia road race in Italy during a record-breaking drive with an average speed of almost 98 mph in a Mercedes-Benz 300 SLR. Although there was some activity in the intervening years, it was not until 1987 that Mercedes-Benz returned to front line competition, returning to Le Mans, Deutsche Tourenwagen Meisterschaft (DTM), and Formula One with Sauber. The 1990s saw Mercedes-Benz purchase British engine builder Ilmor (now Mercedes-Benz High Performance Engines), and campaign IndyCars under the USAC/CART rules, eventually winning the 1994 Indianapolis 500 and 1994 CART IndyCar World Series Championship with Al Unser, Jr. at the wheel. The 1990s also saw the return of Mercedes-Benz to GT racing, and the Mercedes-Benz CLK GTR, both of which took the company to new heights by dominating the FIA's GT1 class. Mercedes-Benz is currently active in four motorsport categories, Formula Three, DTM, Formula One and GT3. Both Mercedes-AMG Formula One cars at the 2013 Malaysian Grand Prix. Mercedes-Benz took part in the world championship in 1954 and 1955, but despite being successful with two championship titles for Juan-Manuel Fangio, the company left the sport after just two seasons. Mercedes-Benz returned as an engine supplier in the 1990s and part-owned Team McLaren for some years, to which it has supplied engines engineered by Ilmor since 1995. This partnership brought success, including drivers championships for Mika Häkkinen in 1998 and 1999, and for Lewis Hamilton in 2008, as well as a constructors championship in 1998. The collaboration with McLaren had been extended into the production of road-going cars such as the Mercedes-Benz SLR McLaren. In 2009, Ross Brawn's newly conceived Formula One team, Brawn GP used Mercedes engines to help win the constructor's championship, and Jenson Button to become champion in the F1 drivers' championship. At the end of the season, Mercedes-Benz sold its 40% stake in McLaren to the McLaren Group and bought 70% of the Brawn GP team jointly with an Abu Dhabi-based investment consortium. Brawn GP was renamed Mercedes GP for the 2010 season and is, from this season on, a works team for Mercedes-Benz. As of 2017, the company currently provides engines to Williams Martini Racing and Sahara Force India F1 Team. Adolf Daimler – chief engineer, COO and member of the board of directors 1899-1913. Son of Gottlieb Daimler and developer of the brand logo. Rudolf Caracciola – one of the greatest GP drivers in history drove MB Silver Arrows in competition. Josef Ganz - Technical consultant and "Godfather" of the *Mercedes-Benz W136, with the revolutionary Independent suspension, Swing axle layout. Juan Manuel Fangio - Five time Formula 1 World Champion, honorary president of Mercedes-Benz Argentina from 1987 until his death in 1995. Michael Schumacher - Seven time Formula 1 World Champion, drove for Mercedes in the World Endurance Championship in the 80s and then in their Formula One Team from 2010 till 2012. Lewis Hamilton - Five-time Formula 1 World Champion, current driver for in their Formula One Team since 2013 who holds the record for most pole positions in F1 since the 2017 Italian Grand Prix. Despite being a Mercedes driver since 2013, Hamilton has competed his entire career using Mercedes engines since 2007 and has been affiliated with Mercedes since he was 13 years old. Nico Rosberg - 2016 Formula 1 World Champion, drove for Mercedes in their Formula One Team from 2010 till 2016. Rosberg won all his races and achieved all his pole positions with Mercedes and is currently a brand ambassador for Mercedes. In 1936, the Mercedes-Benz 260 D was the first diesel-powered passenger car. In the 1980s, Mercedes built the world's first robot car, together with the team of Professor Ernst Dickmanns at Bundeswehr University Munich. Encouraged in part by Dickmanns' success, in 1987 the European Union's EUREKA programme initiated the Prometheus Project on autonomous vehicles, funded to the tune of nearly €800 million. In 1995 Dickmanns' re-engineered autonomous S-Class Mercedes took a long trip from Munich in Bavaria to Copenhagen in Denmark, and back. On highways, the robot achieved speeds exceeding 175 km/h (109 mph) (permissible in some areas of the German Autobahn). Several companies have become car tuners (or modifiers) of Mercedes Benz, in order to increase performance and/or luxury to a given model. AMG is Mercedes-Benz's in-house performance-tuning division, specialising in high-performance versions of most Mercedes-Benz cars. AMG engines are all hand-built, and each completed engine receives a tag with the signature of the engineer who built it. AMG has been wholly owned by Mercedes-Benz since 1999. The 2009 SLS AMG, a revival of the 300SL Gullwing, is the first car to be entirely developed by AMG. Mercedes-Benz sponsors the German national football team. In football (soccer), Mercedes-Benz sponsors the Germany national team. Mercedes-Benz sponsors Bundesliga club VfB Stuttgart and provides the naming rights for their stadium, the Mercedes-Benz Arena. The company also holds the naming rights to the Mercedes-Benz Superdome, an American football stadium in New Orleans, Louisiana, United States. On 24 August 2015, Mercedes-Benz was announced as the naming rights sponsor for the Atlanta Falcons' new home, Mercedes-Benz Stadium, (Mercedes-Benz's US headquarters are in Greater Atlanta) which opened in August 2017. ^ Dudenredaktion; Kleiner, Stefan; Knöbl, Ralf (2015) [First published 1962]. Das Aussprachewörterbuch [The Pronunciation Dictionary] (in German) (7th ed.). Berlin: Dudenverlag. p. 595. ISBN 978-3-411-04067-4. ^ Krech, Eva-Maria; Stock, Eberhard; Hirschfeld, Ursula; Anders, Lutz Christian (2009). Deutsches Aussprachewörterbuch [German Pronunciation Dictionary] (in German). Berlin: Walter de Gruyter. p. 738. ISBN 978-3-11-018202-6. ^ Taylor, Edward; Tajitsu, Naomi; Hummel, Tassilo; Frost, Laurence (January 11, 2019). "Volkswagen delivered 10.8 million vehicles in 2018, eyes world No.1 spot". www.reuters.com. Retrieved January 11, 2019. ^ "Best Global Brands - 2014 Rankings". Interbrand. Archived from the original on 15 March 2015. Retrieved 26 March 2015. ^ Auer, Georg. "A genius whose three-wheeler is seen as the first car". European Automotive Hall of Fame. ^ a b "Mercedes-Benz History". Edmunds.com. Archived from the original on 1 March 2009. Retrieved 26 September 2010. ^ "Global design network: Mercedes-Benz opens new Advanced Design Centre". Daimler. ^ "DPMAregister - Marken - Registerauskunft". dpma.de. ^ Friedrich, Schildberger (18 July 2007). Gottlieb Daimler, Wilhelm Maybach and Karl Benz. Daimler-Benz Aktiengesellschaft. ^ Klara, Robert (13 September 2015). "Hitler's car exerts grim fascination even if it just gave the Führer a lift to the airport". The Guardian. Retrieved 31 January 2016. ^ Junk Jet n°2. igmade.edition. pp. 6–. GGKEY:W6X3P50T22D. ^ "Daimler-Benz to Pay $12 Million for War Forced Labor". Los Angeles Times. 12 June 1988. ISSN 0458-3035. Retrieved 2 November 2016. ^ a b c "Mercedes-Benz Safety Innovations". Theautochannel.com. 13 September 2010. Retrieved 26 September 2010. ^ "Behind the Scenes: Mercedez-Benz AMG". Motortrend.com. 26 February 2007. Archived from the original on 10 August 2010. Retrieved 26 September 2010. ^ "The history of Mercedes-AMG GmbH". Media.daimler.com. 20 December 2000. Archived from the original on 25 February 2010. Retrieved 26 September 2010. ^ "This Is Tesla's Big Chance In China. Will It Be Blown Again?". Forbes. 8 September 2016. Retrieved 8 September 2016. ^ "Daimler to sell Mercedes-Benz branded all-electric battery cars in China". Reuters UK. 7 September 2016. Retrieved 8 September 2016. ^ Martin, Norman (1999). "Going, Going, Graz". Automotive Industries. Archived from the original on 28 June 2009. ^ "Informações Corporativas: DaimlerChrysler no Brasil" [Corporate Information: DaimlerChrysler in Brazil] (in Portuguese). DaimlerChrysler. Archived from the original on 30 January 2009. ^ "Mercedes Attacks BMW From Hungary With New Facility". Washington Post. Retrieved 29 March 2012. ^ "Daimler plans 79 million Mercedes-Benz plant expansion". Bloomburg. Retrieved 27 June 2012. ^ "Mercedes-Benz Indonesia – Passenger Cars homepage". Mercedes-benz.co.id. Retrieved 26 September 2010. ^ "IKCO, Daimler sign agreement". MEHR news agency. 19 January 2016. ^ "Anambra Motor Manufacturing Company Ltd". Anammco.com. Retrieved 26 September 2010. ^ "South Africa's automotive industry". SouthAfrica.info. Archived from the original on 15 April 2010. Retrieved 26 September 2010. ^ "Mercedes-Benz readies PHEV batteries". Retrieved 1 August 2018. ^ "Thonburi Group:Serving the Thai market for more than six decades". Archived from the original on 27 September 2009. Retrieved 15 October 2009. ^ "Mercedes-Benz Türk - Otomobiller". mercedes-benz.com.tr. ^ "MBUSI Products/Models". Mbusi.com. Archived from the original on 22 August 2010. Retrieved 26 September 2010. ^ "Mercedes-Benz Vietnam Company Overview". mercedes-benz.com.vn. Daimler AG. 2010. Archived from the original on 23 November 2010. Established in 1995...Mercedes-Benz Vietnam....supplies both passenger cars and commercial vehicles to the market. ^ "Business Week, November 2006". BusinessWeek. Retrieved 26 September 2010. ^ "J. D. Power and Associates Reports: Ford Motor Company Captures Most Awards in 2007 Initial Quality Study". Jdpower.com. 6 June 2007. Archived from the original on 26 November 2009. Retrieved 26 September 2010. ^ a b "2008 Initial Quality Study | J. D. Power and Associates". Jdpower.com. 4 June 2008. Archived from the original on 25 November 2009. Retrieved 26 September 2010. ^ "2011 U.S. Initial Quality Study (IQS)". JDpower.com. June 2011. Archived from the original on 31 July 2011. Retrieved 25 August 2011. ^ "2011 U.S. Vehicle Dependability Study". JDpower.com. March 2011. Archived from the original on 10 August 2011. Retrieved 25 August 2011. ^ "Mercedes-Benz Trucks – "Trucks you can trust" - Daimler > Brands & Products > Our Brands > Mercedes-Benz Trucks". daimler.com. 4 December 2013. Archived from the original on 4 February 2011. ^ "Mercedes-Benz builds new armoured Pullman State Limousine". gizmag.com. ^ Ewing, Steven (11 November 2014). 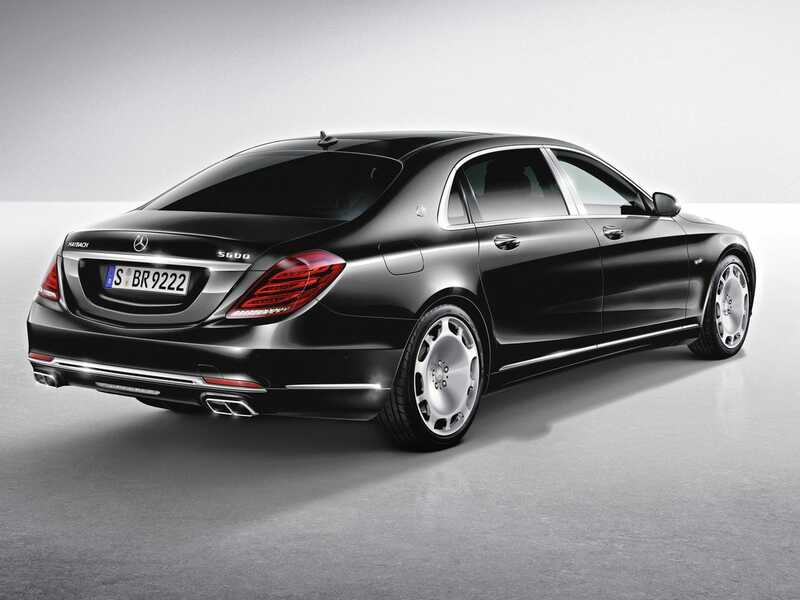 "Mercedes renames utility vehicles, repositions Maybach as sub-brand". Autoblog.com. Retrieved 12 November 2014. ^ "Mercedes-Benz expands brand world and introduces new nomenclature: Mercedes-Maybach for the ultimate in exclusivity and individuality". Daimler AG. 11 November 2014. Archived from the original on 12 November 2014. Retrieved 12 November 2014. ^ "New Mercedes X-Class arrives and the 'premium pick-up' is born". Auto Express. Retrieved 27 October 2016. ^ "Mercedes-Benz X-Class concept previews new pick-up". Retrieved 1 November 2016. ^ Bubbers, Matt (8 November 2016). "For decades the future of electric vehicles has seemed a few years away". The Globe and Mail. Retrieved 28 November 2016. 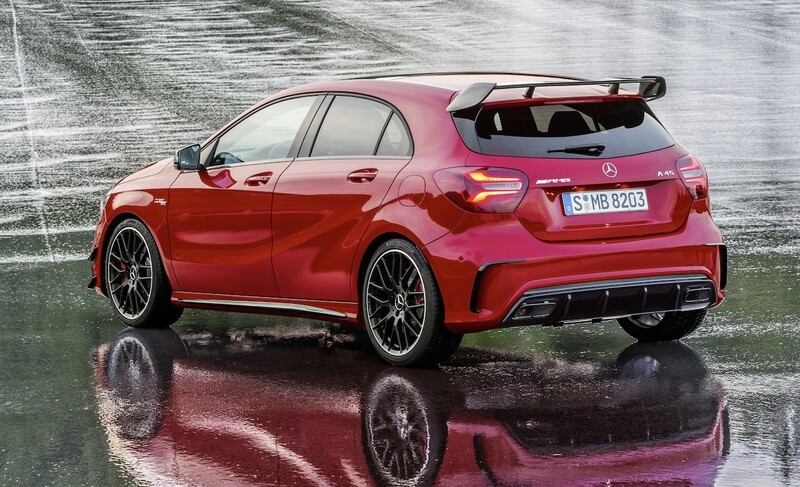 ^ "2016 Mercedes-AMG A 45 gets boosted engine, 0-100km/h in 4.2sec". ^ "Mercedes' Ultra Luxury Maybach Brand Is Making A Comeback". ^ "Mercedes vehicles at the 2007 Frankfurt show". Emercedesbenz.com. 6 September 2007. Archived from the original on 1 March 2010. Retrieved 26 September 2010. ^ "Mercedes-Benz Concept BlueZERO: Modular Drive Concept for Electric Vehicles". Daimler AG. 15 December 2008. Archived from the original on 15 March 2009. Retrieved 26 April 2009. ^ "Mercedes-Benz BlueZero Concept (2009) with pictures and wallpapers". NetCarShow.com. Retrieved 26 April 2009. ^ "The Ultimate Posting on Plug-In Hybrid Developments: Clip & Save". Calcars.org. Retrieved 17 December 2009. ^ "Mercedes-Benz SLS AMG E-Cell-Prototype Drive". Car and Driver. Retrieved 25 August 2011. 2 Champion in the Luxury Class with Efficient Hybrid Drive System and Lithium-Ion Technology | Daimler > Brands & Products > News". Daimler AG. 17 September 2008. Archived from the original on 14 March 2009. Retrieved 26 April 2009. ^ Abuelsamid, Sam (29 February 2008). "Mercedes-Benz S400 BlueHybrid, first production lithium ion hybrid". AutoBlogGreen.com. Retrieved 26 April 2009. ^ "Mercedes enters the hybrid game – the S400 BlueHybrid". AutoUnleashed.com. Archived from the original on 15 April 2009. Retrieved 26 April 2009. ^ "2007 IAA Report – S-Class hybrid". Caranddriver.com. Retrieved 26 September 2010. ^ Abuelsamid, Sam (30 July 2010). "Mercedes-Benz introduces new Vito E-Cell van – Autoblog Green". Green.autoblog.com. Retrieved 26 September 2010. ^ Healey, James R. (23 March 2008). "Mercedes sees electric-car progress". USA Today. Retrieved 12 May 2010. ^ "Elektromotive.com". Elektromotive.com. 3 June 2010. Archived from the original on 10 July 2011. Retrieved 26 September 2010. ^ "Vehicles Subject to the Gas Guzzler Tax for Model Year 2009 (EPA420-B-08-016)" (PDF). Retrieved 26 September 2010. ^ Gillies, Mark (March 2010). "2011 Mercedes-Benz S63 AMG - Auto Shows". Car and Driver. Retrieved 15 June 2011. 2 Report for 2008". Transport & Environment. Archived from the original on 25 September 2009. Retrieved 21 October 2009. 2 Report for 2007". Transport & Environment. Retrieved 24 November 2008. ^ "CAFE PIC Civil Penalties". one.nhtsa.gov. US Department of Transportation. Retrieved 6 January 2019. ^ "Mercedes-Benz Brings a New Model (of Battery) to U.S. Homes". 18 May 2017 – via NYTimes.com. ^ 4-traders. "New Automotive Cabin Air Filters Give People with Asthma and Allergies a Barrier From Pollen and Air Pollution". ^ Vaish, Esha. "Mercedes unveils electric car in direct German challenge to Tesla". U.S. Retrieved 5 September 2018. ^ "Gunning for the top spot: Mercedes-Benz unveils its first fully-electric car in direct challenge to Tesla". The Economic Times. 5 September 2018. Retrieved 5 September 2018. ^ "Mercedes just revealed how it plans to conquer electric cars — and Tesla should be nervous". Business Insider. Retrieved 31 January 2018. ^ "Mercedes-Benz unveils aggressive electric vehicle production plan, 6 factories and a 'global battery network'". Electrek. 29 January 2018. Retrieved 31 January 2018. ^ Hudson, Paul (23 December 2008). "Telegraph 23 December 2008". The Daily Telegraph. UK. Retrieved 12 March 2011. ^ "The official Formula 1 website". Formula1.com. 24 June 1911. Archived from the original on 29 June 2007. Retrieved 26 April 2009. ^ "Ilmor: Bowmen of the Silver Arrows". Atlasf1.autosport.com. Retrieved 26 April 2009. ^ "FIA: $100M fine handed to Mercedes". FIA. Archived from the original on 8 April 2009. Retrieved 26 April 2009. ^ Benson, Andrew (3 July 2016). "Formula 1 2016: All you need to know about the teams". BBC Sport. Retrieved 8 November 2016. ^ Davis, Jim (22 June 2012). "The True Story Behind the Mercedes-Benz Three-Pointed Star". emercedesbenz.com. Archived from the original on 16 February 2016. ^ Daimler (2018). "The Mercedes star is born". Daimler AG. Stuttgart, Germany. Retrieved 9 September 2018. ^ "Daimler press release 8 June 2009". Media.daimler.com. 8 June 2009. Archived from the original on 8 July 2011. Retrieved 12 March 2011. ^ "Mercedes-Benz Classic website". Mercedes-benz-classic.com. Retrieved 12 March 2011. ^ "Porsche website". Porsche.com. Retrieved 12 March 2011. ^ "Automotive Hall of Fame". Automotive Hall of Fame. Archived from the original on 20 July 2011. Retrieved 12 March 2011. ^ "A Nazi War Criminal's Life in Argentina". Spiegel Online International. Archived from the original on 25 January 2011. Retrieved 1 April 2011. ^ "A Nazi Criminal life in Argentina". Spiegel.de. ^ a b "Magazine". Roadsafe.com. Archived from the original on 1 December 2008. Retrieved 26 September 2010. ^ "New Mercedes Diesel Engine Breaks World Endurance Record". Edmunds.com. Archived from the original on 23 September 2009. Retrieved 29 September 2010. ^ "Performance: AMG 2.0-Liter Turbo Engine". Archived from the original on 16 May 2013. Retrieved 6 June 2013. ^ Schmidhuber, Jürgen (2009). "Prof. Schmidhuber's highlights of robot car history". Retrieved 15 July 2011. ^ "Mercedes' Vision Tokyo Concept: A Self-Driving Rave Van". www.yahoo.com/autos. Retrieved 27 October 2015. ^ "Mercedes-Benz Ireland – New cars – AMG". Mercedes-benz.ie. Archived from the original on 29 July 2010. Retrieved 26 September 2010. ^ "History of AMG". Pistonheads.com. 18 October 2002. Retrieved 26 September 2010. ^ "Mercedes-Benz buys naming rights for Superdome, home of New Orleans Saints - ESPN". Espn.go.com. 4 October 2011. Retrieved 1 September 2012. ^ Tucker, Tim. "Falcons officially announce Mercedes-Benz as naming rights partner". Atlanta Journal Constitution. Retrieved 24 August 2015.